Suited up in life jackets and helmets, we stand on the grass near the banks of the Rio Utcubamba near Chachapoyas, Peru. The raft is inflated but not yet afloat, the sun is shining, and for now, at least, everything is tranquil. “Before we go, a quick safety lesson,” says Nilo in Spanish. He arranges us in the beached raft, which will carry the six of us. “You sit here on the side,” he explains, “with your front foot underneath. Here.” Sat like this, with one foot anchoring each us to the floor of the raft, our chances of being thrown out of the boat are minimal, or that’s the plan, at least. “Now, four commands. Adelante. Forward. Atras. Back. Alto. Halt. Adentro. Get inside the boat.” He elaborates on each of the four paddling commands we’ll need to navigate the river. We listen as best we can, eager to get going. We have no idea that two hours later these same commands will still be stuck in our heads like a stubborn rock in a white-water river. “Adelante” says Nilo in a calm voice, sitting up on the stern. We set off from the bank of the Rio Utcubamba, the six of us paddling in unison down a smooth slide of grey-brown water. The landscape around us begins in rocky riverbanks and rises up through scrub and trees to the ridges of the canyon. Colorful birds flit around, hummingbirds and occasional small swallows diving at the river. “Adelante con fuerza!” he shouts and we plunge our paddles into the flow, con fuerza, with force. The prow rolls up and over a wave and descends down the other side just as quickly. Laughs and screams from the crew. We’re all soaked. “Adelante, adelante! Con fuerza!” We’re not through the rapid yet, and a boulder is looming to the left of us, cutting through the water with obstinate force. “Atras! 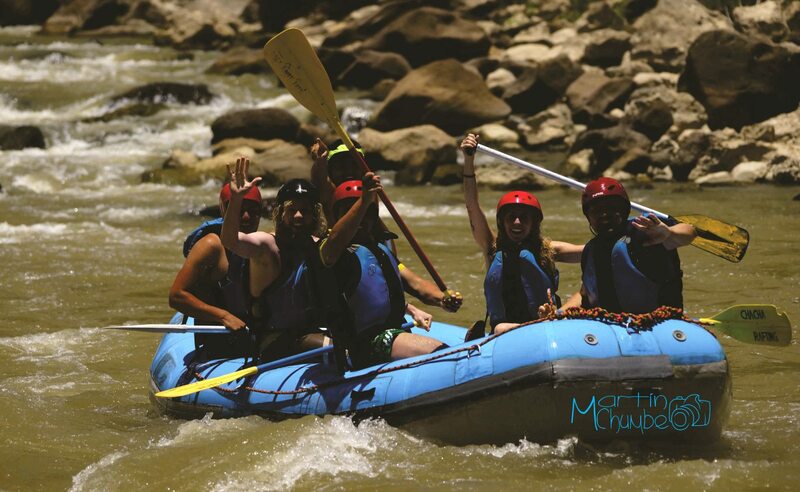 Atras!” We respond as best we can, changing to a reverse paddle, forcing the raft backwards, digging into the river to spin us sideways and away from the rock. Another wave emerges from below like a watery jowl intent on swallowing us, the jaw scattering into spray as it strikes the side of the raft. I can hear Bryony laughing behind me. I look back and see Jack smiling. Nilo gives the command to halt. 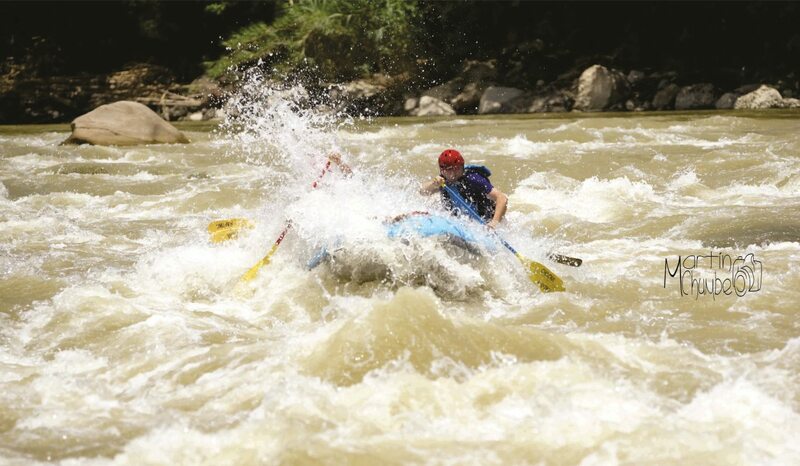 “Adentro!” shouts Nilo as we surge down another rapid and too close to a brutish-looking boulder. It emerges from the froth, looming immediately to our left. “Adentro!” Too late to paddle clear, we sink down to the floor of the raft for protection. The raft narrowly misses the boulder and we spin around. More laughter. 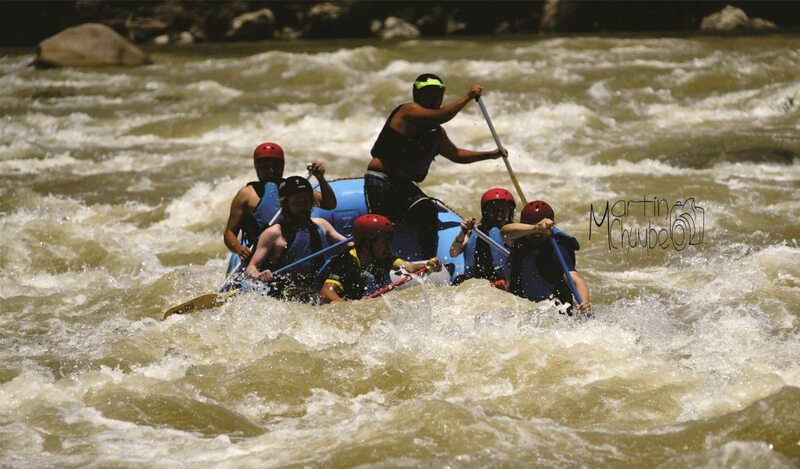 Nilo shouts “Adelante!” We retake our seats on the sides of the raft and immediately start paddling through the relentless rapid. “Adelante con fuerza!” With force. Smiling and laughing. The Rio Utcubamba taking us on its way. 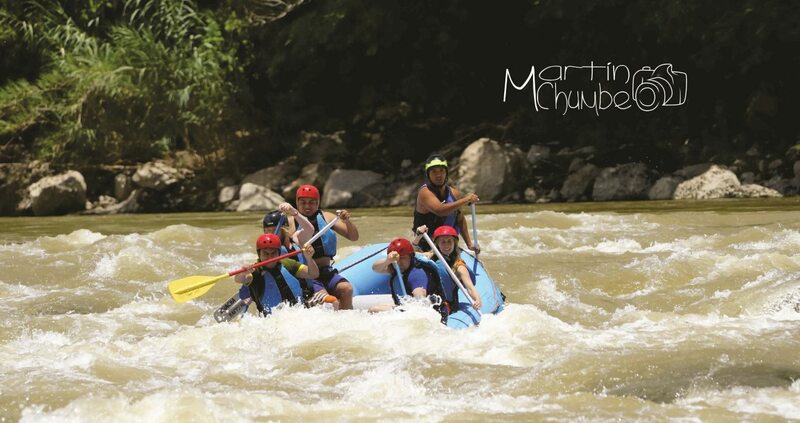 Rafting on the Rio Utcubamba is a fairly new outdoor sport in the region. The pioneers are Chacha Rafting (www.chacharafting.com), who at time of writing were operating from the Amazon Expedition (amazonexpedition.com.pe) office on Chachapoyas’ Plaza de Armas (Jr. Ortiz Arrieta 508). You’ll be on the river for about one and a half hours. All equipment is provided. 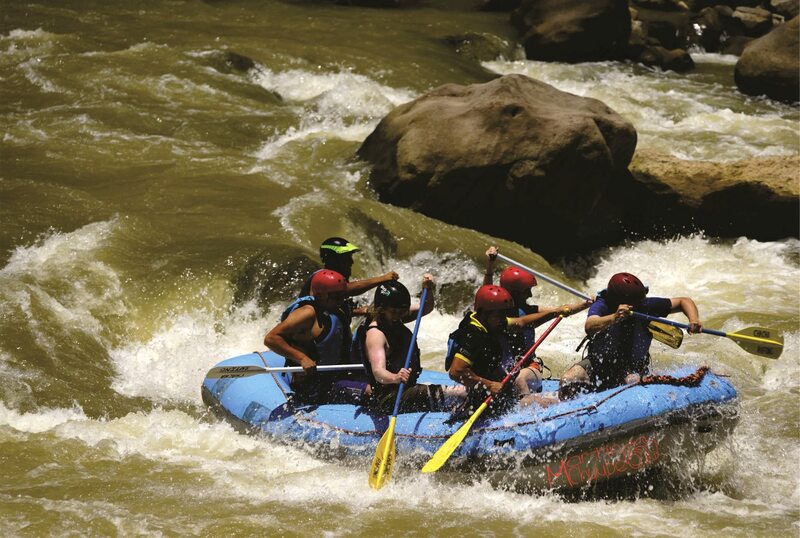 The rapids are Class III, so you don’t need any kind of experience to give it a go. 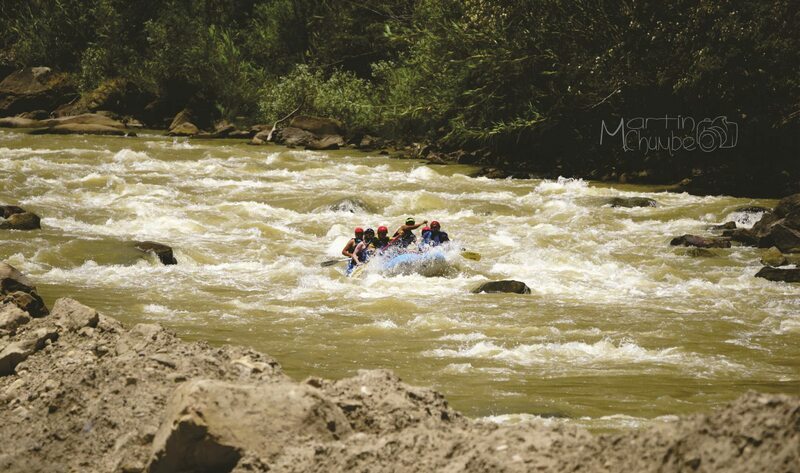 Rafting starts at S/ 80 per person. All photos in this post are by Martin Chumbe, a professional photographer from Chachapoyas, Peru.